Umbilical cord blood stem cell transfusions are currently being used as an alternative to bone marrow transplants for many life threatening conditions. Your baby’s stem cells are a perfect match for your child, and the properties of cord blood stem cells mean they more easily integrate into a patient’s body. 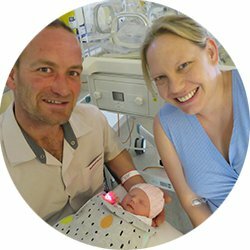 Factors such as these, along with Cell Care’s assistance, were a key driver behind Lauren’s choice to store her baby’s stem cells. Lauren Whitelock, VIC, February 2018.